I went through every kite photo on my computer. There are probably duplicates and some that got left out. Such is life. The highlight was finding the 15 photos of the 2004 Christoph Fokken prototype we were sworn to secrecy on. I'm guessing the statue of limitations is about out on that one so they're all in there. Again, please feel free to leave comments and I will add them as text. If you find any duplicates, just leave a comment to that effect. Text will slowly be added and you are all welcome to write any tidbits, but let us strive for accuracy. (John Rollins is not Ken McNeill ). Wow! I remember that kite. It was, um, different. Nice shade of green, though. someone's two favorite things together at last ... kites 'n thongs! are the black triangles on the TE standoff placements? ? I was surprised to see what was more of a development platform than a prototype out in public. In software terms, I'd call it an Alpha release rather than Public Beta. It looks like the prototype became the Obsession 2 judging from the wingtip treatment especially. Don't know what happened to the bikini bottom front panel though. Brought back some nice memories - especially the TT fun fly and the BBQ party at Baylands. John you have it right. That proto did become the Obsession 2. I was one of the people that got to test the protos, there were two different protos. 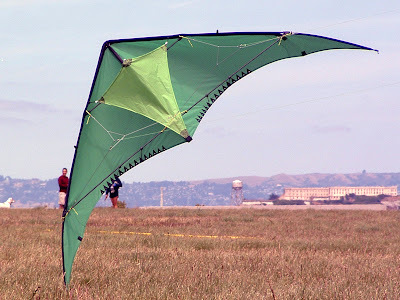 This green kite was the first. The second did not have the "thong" and we got it about a month after the first to test. Both the protos came in what ever color they had laying around to build them. My first was green like this one my second one was all yellow. As I recall the "thong' was an idea to try to find a way of flying tricks in very high winds and could not be adjusted, it just attached as you can see in your photos. 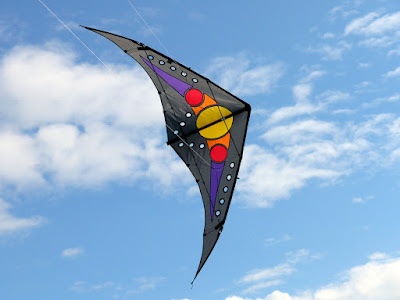 The goal as I recall was to develop a kite that could trick in up to 25 mph winds. It was left off the second proto because the input from all the testers said that it just did not work all the well. 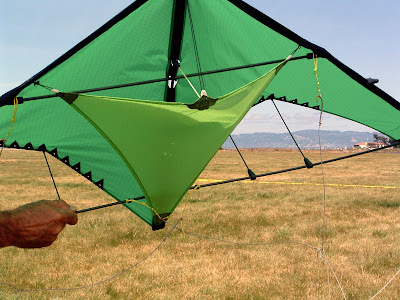 The multi stand off positions were for testing how the kite would fly at different settings just as anyone building a new kite would do on their protos. I still have both protos and all of us that tested them recieved a Obsession 2 for our help.